As spending his first full MLB season as a relief pitcher, Wainwright briefly assumed closer duties, saving the series-clinching games of both the 2006 National League Championship Series and World Series. The next season, he returned to starting pitching, a role in which he has since remained, except for 2011, which he missed due to Tommy John surgery. He emerged as an ace as he led the National League multiple times in wins, innings pitched, and games started. He also has multiple top-ten finishes in earned run average, strikeouts, walks plus hits per inning pitched, and complete games. In 2014, he became the first pitcher in Major League history to post nine of his first 18 starts with seven innings pitched and no runs allowed. In his career, Wainwright has won more than 100 games, three All-Star selections, two Rawlings Gold Glove Awards and finished in the top three in the Cy Young Award balloting four times. With 1,473 strikeouts in his career to date, Wainwright is second to Bob Gibson (3,117) in Cardinals franchise history in strikeouts. He runs a fantasy football league where the registration fees go to charity. He is currently signed through 2018. Wainwright was born in Brunswick, Georgia, to Bill, an attorney, and Nancy Wainwright, a real estate agent. However, his parents divorced when he was seven years old and his father moved to Florida, leaving only Wainwright's mother to raise him and his older brother Trey, now also an attorney in Atlanta. Wainwright credits Trey, seven years his senior, with teaching him everything he knows about sports after their father left, including building a pitcher's mound in their back yard to teach Adam how to pitch. The young Wainwright also participated in the Cub Scouts, Boy Scouts and numerous church activities, and grew up a huge Braves fan. Wainwright attended high school at Glynn Academy in his native Brunswick where he was an athletic and academic standout. A multi-sport athlete, Wainwright also played football, in which he was named to the All-State team as a wide receiver his junior and senior years as well as All-Region honors as a placekicker. 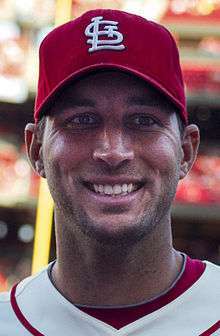 With a fastball over 90 mph and batting average at times over .500, his future would lie in baseball, however, and Wainwright was named Gatorade Georgia Player of the Year in 2000. He garnered considerable interest from colleges and universities offering both academic and baseball scholarships, including Georgia Tech. When the Atlanta Braves selected him 29th overall in the first round of the 2000 MLB draft, Wainwright chose to forgo college to go straight to the pros, signing a contract that included a $1.25 million bonus. The Braves had been his favorite team growing up. Less than two weeks after high school graduation Wainwright reported to the Braves rookie team and soon advanced to Atlanta's Class A Danville Braves in the [Appalachian League]. He pitched for the Macon Braves in the South Atlantic League in 2001 where he broke the team record for strikeouts, previously held by Bruce Chen, with 184. 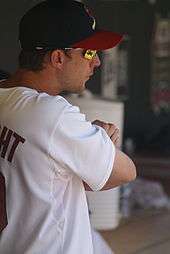 Wainwright spent the 2002 season in the Carolina League and also participated in that season's All-Star Futures Game. In 2003, Wainwright advanced to the Braves' Double-A club, Greenville. He was Baseball America's top Braves prospect in 2003. In December of that year, the St. Louis Cardinals acquired Wainwright with pitchers Jason Marquis and Ray King in a trade that sent outfielder J. D. Drew and utility player Eli Marrero to the Braves. Wainwright pitched just 12 games for the Triple-A Memphis Redbirds when he was shut down for nearly all the rest of the season with an elbow strain. There, he had a 4–4 won–loss record (W–L) with a 5.37 earned run average (ERA) in 63 2⁄3 innings pitched (IP). He struck out 64 and allowed 68 H and 28 BB. In the Arizona Fall League, he returned to pitch ten innings. The next season, he spent with Memphis, starting 29 games, completing 182 IP and allowing 204 hits, 51 BB and striking out 147. His W–L record was 10–10. 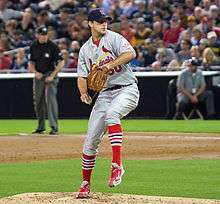 After two somewhat uneven seasons in the Cardinals' minor-league system, Wainwright made his MLB debut for St. Louis on September 11, 2005. Wainwright made the Cardinals' Opening Day roster as a relief pitcher after having been a starter for his entire minor-league career. On May 24, 2006, he hit a home run on the first pitch he saw as batter in the major leagues against the San Francisco Giants' Noah Lowry; he became the 22nd batter in Major League history and 11th National Leaguer to hit a home run off the first pitch thrown in his first at-bat. On October 8, 2006, Wainwright closed out the final game of the Cardinals' National League Division Series, ending the San Diego Padres' season and propelling the Cardinals to the 2006 National League Championship Series. On October 19, 2006, in the final game of the National League Championship Series, Wainwright, with the bases loaded, struck out future teammate Carlos Beltrán looking on a now-legendary curveball, ending the New York Mets' season and sending the Cardinals to the World Series. On October 27, 2006, in Game 5 of the 2006 World Series, Wainwright struck out Detroit Tigers third baseman Brandon Inge with a slider to win the world championship. Wainwright moved from the bullpen to the starting rotation for 2007. Shortly after losing ace Chris Carpenter for the year due to elbow surgery, Wainwright emerged as the Cardinals' most reliable starter. On August 10, he threw the first complete game of his career, a 2–1 loss to Los Angeles, and the only nine-inning complete game for the Cardinals that season. By September, Wainwright had established himself as the staff ace in Carpenter's absence, going 9–6 with a 2.94 ERA from mid-May to the end of the season. He finished his first year by leading the club in almost every pitching category – games started, innings pitched, strikeouts, and wins – while compiling a 3.70 ERA and a 14–12 record. His 14 wins were the most in franchise history for a first-year starter. His 2.71 ERA after the All-Star break was third-best in the NL. In March, 2008, Wainwright signed a four-year deal with the Cardinals worth $21 million, with two club options for 2012 and 2013 that made the potential aggregate value $36 million. He gave up four runs or less in each of his first seven starts. However, the Cardinals lost to the Brewers 8–3 in Wainwright's eighth start on May 13 as Ryan Braun hit two home runs off him. He suffered a strain on the middle finger of his pitching hand in June, causing him to miss 2 1⁄2 months of the season. In 20 starts, he finished 11–3 with a 3.20 ERA. On August 19, 2009, at Dodger Stadium, Wainwright pitched a no-hitter going against the Los Angeles Dodgers for 5 1⁄3 innings before Orlando Hudson broke it up with a clean single to left field. In his next start against the Astros, he pitched eight shutout innings to pick his then-major league-leading 15th win in a 1–0 victory. It was his 25th straight start with at least six innings pitched. In five August starts that season, he completed 35 2⁄3 IP with just one walk and 22 SO. On September 26, he pitched eight innings and struck out eleven for a 6–3, NL Central division-clinching victory against the Colorado Rockies at Coors Field for his 19th win. Wainwright finished with a 19–8 record and a 2.63 ERA, leading the National League in wins, games started (34), and innings pitched (233). He also struck out a major-league high 140 batters on third-strike curveballs. Pitching in his first All Star Game, Wainwright completed one inning. He faced five batters, throwing 17 pitches for ten strikes and seven balls, and allowed no runs with just one hit – a double off the glove of fellow Cardinal All-Star Matt Holliday – one walk, and two strikeouts. In one eleven-game stretch preceding August 16, he compiled 66 a⁄3 IP in nine of those starts and allowed two earned runs for a 0.27 ERA. Wainwright finished the 2010 season 20–11 with a 2.42 ERA, five complete games, 213 strikeouts, 56 walks, 15 home runs allowed, and a WHIP of 1.05, in 230 1⁄3 IP. His win, strikeout, complete game and shutout totals were all career bests. His win total and ERA were both good for second place in the National League (behind only Josh Johnson's 2.30 ERA, and Roy Halladay's 21 wins). He also pitched the first two shutouts of his career in 2010 – one against the Milwaukee Brewers on June 4 and a two-hitter against the Florida Marlins on August 6. Wainwright was the runner-up for the 2010 NL Cy Young Award, finishing second in voting behind unanimous winner Halladay. Wainwright picked up 28 of 32 second-place votes. Near the end of the season, he had experienced elbow discomfort and nerve swelling. A magnetic resonance imaging (MRI) scan cleared him after the season. Shortly after reporting to spring training, Wainwright experienced discomfort in his right elbow while pitching batting practice on February 21. Three days later, the Cardinals announced that Wainwright would miss the entire 2011 season – and possibly the first three months of the next season – after finding that ulnar collateral ligament damage necessitated Tommy John surgery (TJS). George Paletta, the team physician, performed the surgery on February 28 in St. Louis and it was deemed "a success." Former clients for the same surgery included teammates Chris Carpenter, Jaime García, and Kyle McClellan. Wainwright's contract featured options for 2012 and 2013 totaling $21 million with a provision that they would not automatically vest if he ended the 2011 season on the disabled list. The Cardinals made the playoffs as a wild card entry, overtaking the Braves on the final day of the season. They eventually won the World Series, defeating the Texas Rangers four games to three. The Cardinals awarded Wainwright his second World Series ring, in spite of not pitching the entire season. It was also the second ring he won even though he had yet to start in a World Series game. Fully recovered after TJS and rehabilitation, Wainwright was ready ahead of schedule for spring training. Statistically, the 2012 season proved to be an overall disappointment season by Wainwright's standards, as he wound up 14–13 with a 3.94 ERA. However, it was encouraging in regards to the health of his right arm as he completed the entire season without any issues. In addition, pitchers recovering from TJS often find it challenging at first to throw with the same command as before the surgery, and thus to achieve post-surgery results equal to pre-surgery results. This was the case at first with Wainwright. On May 22, he threw his first complete game shutout since August 6, 2010, and the third of his career in his ninth complete game. It was a four-hit, 4–0 win at home against the San Diego Padres, striking out nine and walking only one. He reached his 1,000th career inning on July 29. The May 22 start marked a turning point in the season. During a 13-start stretch until August 3, he pitched 85 2⁄3 innings, striking out 83 while allowing just four home runs and 17 BB. He attributed the improvement to being able to sustain the usual finishing movement on his pitches through late innings, which earlier in the season, had eluded him, thus making his pitches easier to hit. He also corrected a subtle flaw that had developed on the grip of his curveball during a bullpen session prior to the start against San Diego. The flaw made it increasingly difficult to throw the curveball for consistent strikes. On March 28, 2013, the Cardinals announced they and Wainwright had agreed to a five-year contract extension. At the time, he was under the last year of his previous contract, so the new deal extended him through 2018. With a total value of $97.5 million, it was the largest contract ever for a Cardinals pitcher. On April 18, he became the first pitcher in baseball since 1900 to achieve 28 strikeouts and zero walks in his first four starts of a season. Slim Sallee established the franchise record exactly one hundred years earlier by not issuing a walk in his first 40 innings. Wainwright's streak ended in a start at Washington on April 23 after 34 2⁄3 innings and 133 batters faced. The first MLB pitcher to post 10 wins on June 13, Wainwright put up seven scoreless innings in a 2–1 defeat of the Mets at Citi Field. Moreover, his strikeout of David Wright was his first of the game and the 1,000th of his career. He allowed six hits and struck out a total of four. Wainwright became the NL Pitcher of the Month for June with a 4–2 record and 1.77 ERA. With 40 strikeouts for the month, Wainwright issued just six walks while holding opposing batters to a .220 average. Through that point in the season, he was 11–5 with a 2.22 ERA, and was the MLB leader with four complete games and a 9.5 strikeout-to-walk ratio. In successive starts against the Reds in late August, Wainwright allowed 15 runs, both losses. He struck out eight in seven shutout innings on September 7 at home in a 5–0 win over the first-place Pirates in earning his 16th victory of the season. The Pirates, Reds, and Cardinals were all close contenders for the Central division title in September. The win gave the Cardinals first place over the Pirates by 1⁄2 game, and 1 1⁄2 games over the Reds. Wainwright's seven strikeouts increased his career total to 1,103, passing Dizzy Dean (1,095) for second place among Cardinals' pitchers. Only Bob Gibson (3,117 in 528 games) had more. In a 60-inning stretch following the All-Star break Wainwright had walked 14, compared with 15 in 146 2⁄3 IP before the break. When fellow starter Shelby Miller defeated Nationals' starter Jordan Zimmerman on September 26, he denied him his 20th victory. Two days later, Wainwright, who was second in the league with 18 entering the game, defeated the Chicago Cubs in his final start of the season to tie Zimmerman for the lead in wins at 19. Wainwright also became just the third pitcher in franchise history to twice lead the league in wins, joining Dizzy Dean (1934–35) and Mort Cooper (1942–43). He also led the NL in games started (34), innings pitched ( 241 2⁄3), hits allowed (223), and batters faced (956), and was third in strikeouts. The Cardinals faced the Boston Red Sox in the World Series, and called upon Wainwright to start Game 1 against Jon Lester. It was Wainwright's first World Series appearance since 2006, and first start. He allowed five runs and St. Louis lost, 8–1. In Game 5, a rematch against Lester, the Cardinals again lost, this time 3–1. Wainwright struck out 10 in seven innings, becoming the first Cardinal to reach double digits in strikeouts since Gibson against the Detroit Tigers in 1968. After the Cardinals took a 2–1 Series lead, the Red Sox won the final three games to take the title. Wainwright won his second Gold Glove award in 2013. In the Cy Young balloting, Wainwright placed second, his second such ranking, and finished 23rd in the NL MVP voting. Starting for the Cardinals against the Reds on Opening Day, March 31, 2014, Wainwright won his 100th career decision. In seven innings, he struck out nine and gave up just three singles in a 1–0 win. It was the first Opening Day win of his career while shutting out the Reds on Opening Day for the first time since 1953. At Nationals Park against Washington on April 17, he pitched a two-hit shutout, winning 8–0. He gave up the first hit in the second inning with a high infield chopper, but none after until two outs into the ninth. He walked three and struck out eight. It was his seventh career shutout. In an April 27 start against the Pirates, he tallied eight scoreless innings to extend a streak to 25 innings as the Cardinals won, 7–0, but was pulled before he could get a complete game due to concerns over his April 22 hyperextended right knee injury. His streak of 25 scoreless innings ended in the first inning on May 2 in a loss against the Cubs, to whom he allowed six runs. Arguably the finest game of Wainwright's career was his 195th start on May 20, a one-hitter against the Diamondbacks. He retired the first 11 batters before giving up a double to Paul Goldschmidt in the fourth inning. After the hit, he retired the final 16 batters consecutively, facing only 28, one over the minimum for a perfect game. He walked none and struck out nine, throwing 115 pitches, 86 for strikes. It was his seventh win of the year, tying for the National League lead and his 106th career victory against 59 losses. It also tied him for eighth place with Sallee on the all-time Cardinals' pitching win list and was his eighth career shutout. He followed that effort with eight more scoreless innings on May 25. Between those two starts, he gave up just one walk and struck out a major-league-leading 21 batters in 17 scoreless innings. He was named NL Co-Player of the Week with Dodgers starter Josh Beckett, who threw a no-hitter on May 25. However, he missed his June 16 against the Mets due to elbow tendinitis, but an MRI showed no structural damage to the Tommy John surgically-repaired ligament. After leading the NL with a 1.79 ERA and 11 wins through July 6, Wainwright was selected to his third All-Star Game at Target Field in Minneapolis, Minnesota. He was selected as the NL's starting pitcher for the first time in his career. Besides two starts in which he gave up seven runs to the Giants and six to the Cubs, he had allowed 13 runs in 16 of his first 18 starts. Nine of those starts included totals with seven or more innings pitched and zero earned runs allowed. Per the Elias Sports Bureau (ESB), it was the first time in Major League history that any pitcher achieved that feat in his first eighteen starts of the season. When the Cardinals defeated the Brewers 10–2 on July 12, Wainwright finished his pre-All Star break total with a 12–4 record and a 1.83 ERA. Further, he joined Hall of Fame member Steve Carlton as the only Cardinals to post an ERA less than 2.00 and at least 12 wins before the All-Star break (1969). In that game, Wainwright posted his major-league-leading 15th start of the season with at least seven innings pitched and two or fewer runs allowed. At the plate, his run batted in-single scored rookie Oscar Taveras for his 100th career hit. In the All-Star Game, Wainwright incurred controversy over his remarks about facing leadoff hitter Derek Jeter. Jeter, who was retiring after the season, doubled on Wainwright's second pitch of the game. During interviews, he admitted that he gave Jeter an easy pitch to hit. "I was gonna give him a couple pipe shots. He deserved it", Wainwright said. "I didn’t know he was gonna hit a double or I might have changed my mind." Wainwright later recanted, stating that it was in humor, and that he was "not intentionally giving up hits out there." Conversely, Jeter was appreciative. "He grooved them? The first one was a little cutter that he threw down and away. He probably assumed I was swinging. So he didn't groove the first one. The second was about 90, a two-seamer that stayed on a really good ... No, I don't know, man", he paused and smiled, drawing laughs from reporters. "I have no idea. If he grooved it, thank you. You still got to hit it." Following the All-Star break, Wainwright temporarily struggled to keep the consistency of the first half of the season due to frequent elbow irritation. In June, he gave just four ER in 31 IP for a 1.16 ERA, and followed that up with a 1.62 ERA in July. His results reversed in August when he allowed 22 ER in 38 1⁄3 IP for a 5.17 ERA. However, in September, he posted a 1.38 ERA in 39 IP with 29 SO and a 5–0 W–L. He was subsequently named the NL Pitcher of the Month for September. After the season, Wainwright had a procedure to remove part of the cartilage of the right elbow on October 24. At times – commencing in June – he had altered his mechanics to mitigate the discomfort. In his third-to-last and second-to-last starts of the season – which were in the NLDS against the Dodgers and NLCS against the Giants – he was unable to complete five innings in both starts. This led to speculation Wainwright was pitching with pain, which he denied. Through the 2014 had a career 132 ERA+, third-highest for an active pitcher who has a minimum of 1,000 innings, and a .643 winning percentage, fourth-highest for active pitchers. He finished third in the Cy Young voting for 2014, his third such placing, and fourth time he was positioned in the top three. The Cardinals selected Wainwright to make his fourth career Opening Day start, and the season-opening game for MLB in 2015, in what was also the first-ever MLB Opening Night game. He was credited with the win as the Cardinals defeated the Cubs at Wrigley Field, 3–0. On April 25, he left the game against the Brewers in the top of the fifth after suffering an ankle injury while batting. The next day, the Cardinals placed him on the 15-day disabled list, and announced the following day that he had an Achilles tendon rupture and would likely miss the remainder of the season. He underwent successful surgery to repair the tendon on April 30. With a recovery initially expected to take nine to twelve months, he had made four appearances through that point in the season, going 2–1 with a 1.44 ERA. As the season progressed, he consistently stated his goal was to return to pitching before the end of season. After working diligently to accelerate his recovery, the Cardinals announced on September 21 that he was cleared to resume baseball activities, two weeks prior to the conclusion of the regular season. His actual recovery took five months. Making his first appearance of the season since April, Wainwright pitched a scoreless inning of relief in the first game of a doubleheader against Pittsburgh on September 30, an 8–2 loss. It was his first relief appearance since the 2006 World Series. He was named the Hutch Award winner for 2015. The Cardinals announced before spring training that Wainwright would be the Opening Day starter in 2016, his fifth time. For the three previous seasons, he had gone 41–19 with a 2.61 ERA. For the second consecutive season, the Cardinals opened the MLB season, this time at PNC Park against the Pittsburgh Pirates on April 3. The Cardinals lost the game, 4–1, with Wainwright taking the first loss of the season. He hit his first home run of season in a 10–3 win over the Philadelphia Phillies on May 2, also being credited with his second win. In each of four consecutive plate appearances spanning April 27 to May 7, he became the first Cardinal pitcher since 1900 to garner an extra base hit while batting, per Elias Sports Bureau. On the mound, he struggled early, yielding a 5.04 ERA in his first 16 starts of the season. Wainwright pitched a three-hit, complete-game shutout and 5−0 win against Miami on July 15, 2016; the first hit he allowed was a double to Adeiny Hechavarria in the sixth inning. With four RBI against Colorado on September 20, Wainwright increased his season total to 18, breaking the record for all pitchers in the designated hitter era – since 1973 – and the most since Ferguson Jenkins drove in 20 for the Cubs in 1971. Wainwright has a sinkerball, throwing it in the 90 to 92 miles per hour (145–148 km/h). He also throws a good deal of cutters 84 to 88 miles per hour (135–142 km/h) and curveballs 73 to 77 miles per hour (117–124 km/h) that has dropped more than 8 inches before from top to bottom of the pitch. Less commonly, he also throws a four-seam fastball 90 to 95 miles per hour (145–153 km/h) and a changeup 84 to 86 miles per hour (135–138 km/h). He uses all of his pitches against left-handed hitters, but he does not use the changeup against right-handers. Wainwright's most-used pitch in 2-strike counts is his curveball. In spring training of 2013, he started incorporating an elevated four-seam fastball, making his curveball more effective. A fantasy football enthusiast, Wainwright created and hosts a fantasy football network in eight cities called Big League Impact, designed to raised money for various charities. In 2015, the organization raised more than $1 million total. Other major leaguers including David Wright, Hunter Pence, and John Smoltz host in their respective cities. The concept officially opened in July 2013 with the launch of a website called WainosWorld.com. In an interview with Fox Sports Midwest, Wainwright remarked that the program combined his love of fantasy football with his passion for helping the less fortunate. For a registration fee, all of which goes to charity, fans can assemble their own fantasy team and compete throughout the season against not only Wainwright but his current and former Cardinals teammates Allen Craig, David Freese, and Matt Holliday. Those with the best team records at season's end will receive prizes. The league raised $100,000 in 2013 and supported Operation Food Search and Water Missions International. With longtime aspirations to host an episode of Saturday Night Live, Wainwright made his film debut in the 2016 comedy-drama Proximity, directed by Dan Steadman and filmed in the St. Louis area. The majority of the work done was completed in 2015, after the opportunity presented to Wainwright due in part to the Achilles tendon injury he had suffered early in the season. Wainwright married his high school sweetheart, Jenny Curry, in 2004. In a quirk of fate, he was in the midst of proposing to Curry in December, 2003, when a telephone call interrupted him to inform him he'd been traded from the Braves to the Cardinals. Mrs. Wainwright holds a degree in interior design from Georgia Southern University. In the off-season, the Wainwrights reside on St. Simons Island, Georgia, with their three daughters, Baylie Grace (born September 10, 2006) Morgan Addison (born October 22, 2008), and Macy (born November 7, 2011, days after the Cardinals won the World Series). Wainwright has openly expressed his Christian faith, and is active in the Fellowship of Christian Athletes. Wikimedia Commons has media related to Adam Wainwright. a Wainwright became just the second pitcher in the history of the Cy Young Award to garner the most first-place votes and not win the award. In 1998, San Diego's Trevor Hoffman collected 13 first-place votes and Atlanta's Tom Glavine totaled 11. However, Glavine amassed the most points, 98–88, and thus was the winner. ↑ Career Leaders & Records for Strikeouts. Baseball-Reference. Retrieved September 21, 2016. 1 2 3 4 5 6 7 8 9 "Adam Wainwright biography". Jock Bio.com website. 2006. Retrieved March 29, 2013. 1 2 3 4 5 6 7 Darnall, Mark (February 14, 2011). "Cardinals right-hander is thriving in his work and calling". Athletes in Action website. Retrieved March 29, 2013. 1 2 3 "Adam Wainwright statistics & history". Baseball-Reference.com. Retrieved July 13, 2014. 1 2 Crasnick, Jerry (May 14, 2010). "This Card is a triple threat". ESPN.com. Retrieved April 28, 2014. ↑ "Braves acquire Drew in deal with Cards". ESPN.com. Associated Press. December 14, 2003. Retrieved July 13, 2014. ↑ "Adam Wainwright profile". Scout.com. Retrieved July 13, 2014. ↑ "Home run with first pitch ever". Baseball Almanac. Archived from the original on December 23, 2008. Retrieved November 29, 2008. ↑ "Cardinals give Wainwright new four-year, $15M deal". ESPN.com. Associated Press. March 20, 2008. Retrieved July 19, 2014. ↑ Leach, Matthew (March 20, 2008). "Wainwright signs long-term deal Cardinals right-hander agrees to four-year contract". MLB.com. Retrieved November 29, 2008. ↑ "Braun homers twice again as Brewers beat Cards". The Oklahoman. Associated Press. May 13, 2008. Retrieved July 19, 2014. ↑ Falkoff, Robert (September 25, 2008). "Wainwright secures winning season". St. Louis Cardinals. MLB. Retrieved July 19, 2014. ↑ "Wainwright shuts down Astros to become NL's first 15-game winner". ESPN.com. Associated Press. August 25, 2009. Retrieved August 14, 2014. ↑ Leach, Matthew (September 27, 2009). "Gutty Wainwright leads Cards to clinch: Righty tosses eight solid innings; LaRue hits go-ahead blast". MLB.com. ↑ "Adam Wainwright stats". MLB.com. February 3, 2013. 1 2 "Carpenter, Pujols and Wainwright presented Players Choice Awards". MLB.com. MLBPA Press Release. April 30, 2010. ↑ Leach, Matthew (November 11, 2009). "Molina, Wainwright nab Gold Gloves: Back-to-back awards for Cards catcher; hurler wins first". MLB.com. 1 2 Haft, Chris (November 19, 2009). "Lincecum's the one; that makes two Cys". MLB.com. Retrieved January 22, 2011. ↑ Cocoran, Cliff (August 16, 2010). "Adam Wainwright, David Price continue to sit atop NL, AL Cy Young chases". Sports Illustrated. Retrieved April 28, 2014. ↑ "Adam Wainwright pitches complete game shutout against the Brewers". KSDK.com. Associated Press. June 4, 2010. Retrieved April 28, 2014. 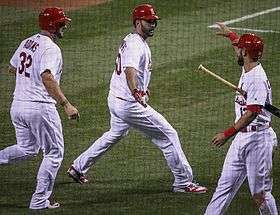 ↑ "Wainwright, Pujols lead Cardinals over Marlins, 7–0". The Sporting News. Associated Press. August 7, 2010. Retrieved April 28, 2014. ↑ Leach, Matthew (November 16, 2010). "Wainwright second to Halladay on Cy ballot". MLB.com. Retrieved November 16, 2010. ↑ Leach, Matthew (February 28, 2011). "Wainwright surgery deemed a success". MLB.com. ↑ Goold, Derrick (February 24, 2011). "Wainwright set for Tommy John surgery". St. Louis Post-Dispatch. ↑ Strauss, Joe (February 24, 2011). "Earlier: Cards, Wainwright 'prepare for the worst'". St. Louis Post-Dispatch. ↑ Leach, Matthew; Noble, Marty (February 24, 2011). "Cards GM: Wainwright needs Tommy John". MLB.com. ↑ "Carpenter, Cardinals win NL wild card". USA Today. Associated Press. September 28, 2011. Retrieved July 21, 2014. ↑ Drelich, Evan (October 22, 2013). "Different than past, Adam Wainwright, Jon Lester leading staffs this World Series". The Republican (MassLive.com). Retrieved July 21, 2014. ↑ Short, D.J. (April 19, 2012). "Adam Wainwright continues to struggle in return from Tommy John surgery". NBC Sports. ↑ Langosch, Jenifer (May 23, 2012). "Wainwright throws first shutout since 2010". MLB.com. ↑ "Active leaders & records for adjusted ERA+". Baseball-Reference.com. Retrieved July 30, 2012. ↑ Keri, Jonah (August 3, 2012). "Adam Wainwright's long and winding road to recovery". Grantland. Retrieved July 13, 2014. ↑ Langosch, Jenifer (March 28, 2013). "Wainwright, Cardinals agree on five-year extension". MLB.com. Retrieved March 28, 2013. ↑ Goold, Derrick (April 23, 2013). "Meet Pea Ridge Day, the Cardinals' hog-calling pitcher". St. Louis Post-Dispatch. ↑ Goold, Derrick (April 20, 2013). "Molina rests; Waino makes history". St. Louis Post-Dispatch. ↑ Greenberg, Jay (April 19, 2013). "Wainwright still hasn't issued a walk". MLB.com. 1 2 Langosch, Jenifer (April 23, 2013). "Wainwright dominates as Cards blank Nats". MLB.com. ↑ Langosch, Jenifer (June 13, 2013). "Wainwright spins gem, becomes first to reach 10 wins". MLB.com. ↑ Simon, Andrew (July 3, 2013). "Wainwright named NL Pitcher of the Month: Cardinals ace won four games, struck out 40 batters in June". MLB.com. ↑ "Cards move into first behind Wainwright gem vs. Pirates". USA Today. Associated Press. September 7, 2013. Retrieved October 3, 2015. ↑ Thornburg, Chad (September 8, 2013). "Wainwright moves to No. 2 on Cardinals' K's list". MLB.com. ↑ McNeal, Stan (September 6, 2013). "Wainwright believes he has recent struggles figured out". Fox Sports Midwest. Retrieved November 11, 2013. ↑ "NL capsules". AP News Archive. Associated Press. September 26, 2013. Retrieved November 11, 2013. ↑ "Wainwright wins 19th, Cardinals beat Cubs 6–2". Daily Herald. Associated Press. September 28, 2013. Retrieved November 11, 2013. 1 2 3 Slover, Ray (October 28, 2013). "Cardinals ace Adam Wainwright seeks Game 5 atonement". Sporting News. Associated Press. Retrieved October 3, 2015. ↑ "Jon Lester outduels Adam Wainwright as Red Sox beat Cardinals, 3–1, to take 3–2 series lead". The Star-Ledger (Nj.com). Associated Press. October 28, 2013. Retrieved October 3, 2015. ↑ Waldstein, David (October 31, 2013). "Red Sox rout Cardinals to win World Series". The New York Times. Retrieved October 3, 2015. ↑ Skretta, Dave (October 29, 2013). "Yadier Molina of St. Louis Cardinals wins sixth straight Gold Glove". ESPN.com. Associated Press. Retrieved October 29, 2013. ↑ Langosch, Jenifer (March 31, 2014). "Cardinals' battery powers shutout of Reds". MLB.com. ↑ Langosch, Jenifer (April 17, 2014). "Waino stymies Nationals with two-hit shutout". MLB.com. ↑ Langosch, Jenifer (April 27, 2014). "Wainwright deals, Peralta powers way to win". Retrieved April 27, 2014. ↑ Popely, Joe (May 2, 2014). "Wainwright allows six runs in loss to Cubs: Right-hander's 25-inning scoreless streak snapped in first inning". MLB.com. ↑ Langosch, Jenifer (May 20, 2014). "Waino rattles Snakes with first career one-hitter". MLB.com. ↑ Fordin, Spencer (May 27, 2014). "Beckett, Wainwright named NL Players of Week". MLB.com. 1 2 Hummel, Rick (May 27, 2014). "Wainwright is NL Player of the Week". St. Louis Post-Dispatch. Retrieved May 27, 2014. ↑ Halsted, Alex (June 14, 2014). "Wainwright to miss Monday's start with tendinitis: Cards' ace says elbow is fine, will likely make following start Saturday vs. Phillies". MLB.com. ↑ Hagen, Pat (July 6, 2014). "All-Stars unveiled, including 26 first-timers". MLB.com. Retrieved July 6, 2014. ↑ Langosh, Jenifer (July 6, 2014). "Will Wainwright start ASG? Matheny to decide". St. Louis Cardinals. MLB. Retrieved July 6, 2014. ↑ Rogers, Phil (July 14, 2014). "Cardinals' Adam Wainwright to start for NL in All-Star Game". Retrieved July 14, 2014. ↑ Stark, Jayson (July 11, 2014). "First-half MLB award winners". ESPN.com. Retrieved July 11, 2014. ↑ Sharp, Katie (July 12, 2014). "Wainwright has the edge over Kershaw". ESPN.com. Retrieved July 12, 2014. ↑ Eisele, Elizabeth (July 12, 2014). "Redbirds crush Brewers 10–2, now tied for first in NL Central". KMOV.com. Retrieved July 13, 2014. ↑ Doyle, Rick (July 16, 2014). "Adam Wainwright backtracks after saying he grooved pitches to Derek Jeter". NESN. Retrieved July 16, 2014. ↑ Greenberg, Chris (July 16, 2014). "Derek Jeter Seemed to be the only one not mad at Adam Wainwright about that pitch". The Huffington Post. Retrieved July 16, 2014. ↑ "Adam Wainwright 2014 pitching splits". Baseball-Reference.com. Retrieved September 30, 2014. 1 2 Goold, Derrick (September 30, 2014). "Wainwright wins NL Pitcher of the Month award". St. Louis Post-Dispatch. Retrieved September 30, 2014. ↑ Langosch, Jenifer (October 24, 2014). "Wainwright has cartilage trimmed from elbow: Cardinals expect ace right-hander to resume throwing in eight weeks". MLB.com. Retrieved October 24, 2014. ↑ "Active Leaders & Records for Adjusted ERA+". Baseball-Reference.com. Retrieved October 6, 2014. ↑ "Active Leaders & Records for win–loss %". Baseball-Reference.com. Retrieved October 6, 2014. ↑ Schoenfield, David (November 12, 2014). "Kluber edges Hernandez for AL Cy Young". ESPN.com. Retrieved November 12, 2014. ↑ Langosch, Jenifer; Muskat, Carrie (April 6, 2015). "Waino, Cards spoil Lester's Cubs debut". MLB.com. Retrieved April 8, 2015. ↑ Langosch, Jenifer (April 26, 2015). "Wainwright placed on 15-day DL with Achilles injury, will have MRI soon". MLB.com. MLB.com. Retrieved April 26, 2015. ↑ "Adam Wainwright expected to miss rest of season with Achilles injury". ESPN.com. Associated Press. April 26, 2015. Retrieved April 26, 2015. ↑ Langosch, Jenifer. "Wainwright undergoes successful Achilles surgery". MLB.com. MLB.com. Retrieved April 30, 2015. 1 2 SI Wire (September 30, 2015). "St. Louis Cardinals activate RHP Adam Wainwright". Sports Illustrated. Retrieved September 30, 2015. ↑ "Cardinals catcher Yadier Molina has partially torn left thumb ligament". ESPN.com. Associated Press. September 21, 2015. Retrieved September 21, 2015. ↑ Langosch, Jenifer (September 30, 2015). "Wainwright appears in first game since April: Cards righty returns from left Achilles tear at least four months ahead of schedule". St. Louis Cardinals. MLB. Retrieved September 30, 2015. 1 2 Stone, Larry (January 27, 2016). "For Hutch Award winner Adam Wainwright, giving back is better than accolades". The Seattle Times. Retrieved January 29, 2016. ↑ Saxon, Mark (February 21, 2016). "Cardinals plan to start Adam Wainwright on Opening Day". ESPN.com. Retrieved February 21, 2016. ↑ Berry, Adam; Langosch, Jenifer (April 3, 2016). "Liriano's 10 K's, RBI send Bucs past Cards". MLB.com. Retrieved April 17, 2016. ↑ Saxon, Mark (May 3, 2016). "Cardinals rally behind Adam Wainwright's hitting". ESPN.com. Retrieved May 3, 2016. ↑ Hummel, Rick (May 7, 2016). "Wainwright settles on mound, continues tear at the plate". St. Louis Post-Dispatch. Retrieved May 8, 2016. ↑ Townsend, Mark (July 16, 2016). "Adam Wainwright rounding into form at right time for Cardinals". Yahoo! Sports. Retrieved August 6, 2016. ↑ Frisaro, Joe; Krueger, Nick (July 16, 2016). "Vintage Waino tosses 3-hit shutout vs. Miami". cardinals.mlb.com. Retrieved July 16, 2016. ↑ Axisa, Mike (September 21, 2016). "Cardinals' Adam Wainwright may be most productive hitting pitcher in 45 years: Wainwright has 18 RBI, most by any pitcher since the DH was introduced". CBSSports.com. Retrieved September 21, 2016. ↑ "Adam Wainwright awards". Baseball Almanac. Retrieved July 13, 2014. ↑ "PITCHf/x Player Card: Adam Wainwright". Brooks Baseball. Retrieved 17 May 2012. ↑ "Waino's World of Fantasy Football Charity Event". Waino's World Inc. via RealTime Fantasy Sports Inc. website. 2013. Retrieved August 1, 2013. ↑ Langosch, Jenifer (July 30, 2013). "Waino launches fantasy football league for charity". MLB.com via St. Louis Cardinals official website. Retrieved August 1, 2013. 1 2 "Adam Wainwright stats, video highlights, photos, bio". St. Louis Cardinals. MLB. Retrieved July 13, 2014. ↑ Fox Sports Midwest (September 1, 2016). "Lights, camera, Waino! Cardinals ace makes film debut in 'Proximity'". Fox Sports Midwest. Retrieved September 6, 2016. ↑ Schremp Hahn, Valerie (September 1, 2016). "Q&A: Adam Wainwright makes his big-screen acting debut in 'Proximity'". St. Louis Post-Dispatch. Retrieved September 6, 2016.